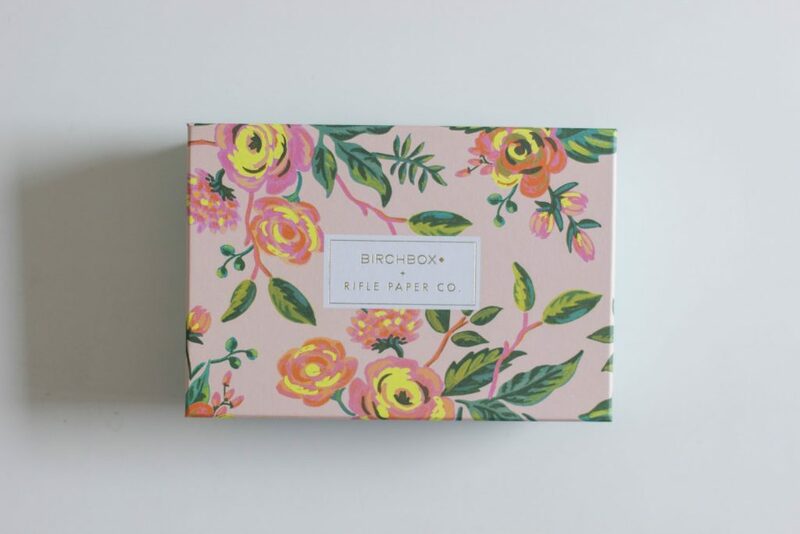 Last year, Birchbox US announced a collaboration with Rifle Paper Co and I’ll admit considering moving to the States just for a moment or two. 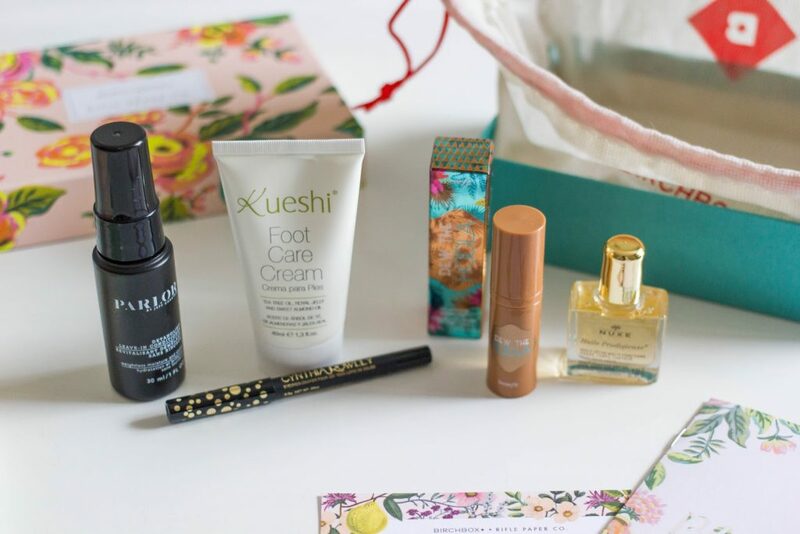 I mean, what could be better than beautiful stationery and beauty products, right? Then my sensible head switched on and I realised it was borderline insane to move continents for one subscription box, so I felt sad and shopped the sadness away in Anthropologie. So when an email dropped into my inbox announcing that this month Birchbox UK were collaborating with Rifle Paper Co? Well the box was ordered before you could say ‘makeup miracle’. 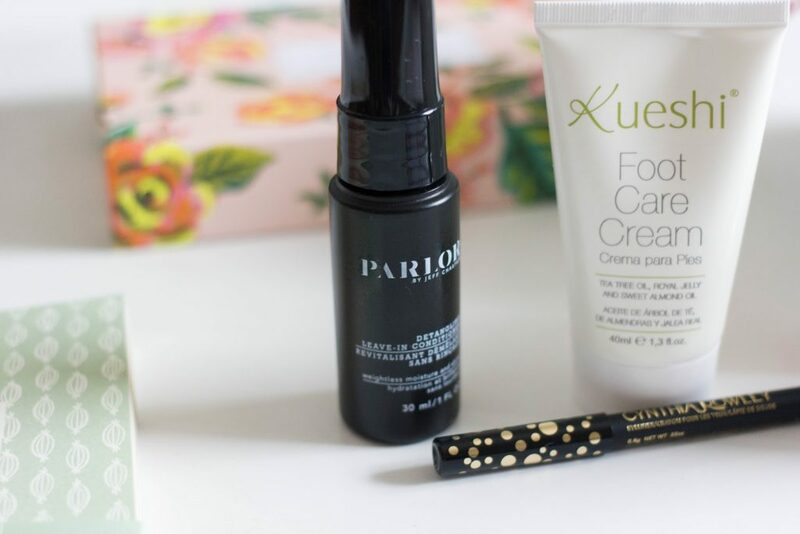 I’m not a monthly Birchbox Subscriber, I only order the boxes that pique my interest, and this one definitely hit the spot for me. You get a choice of box design, I loved both but went for the peachier option because it goes better with my desk colours to use for storage! 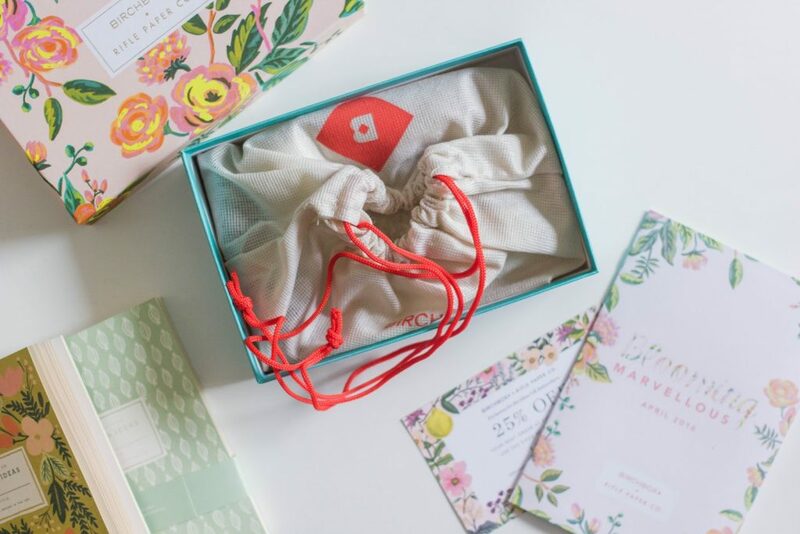 You also receive a 25% off code for any orders placed on Riflepaperco.com, but the shipping is extortionate since it arrives from the US, so it’s kinda pointless. 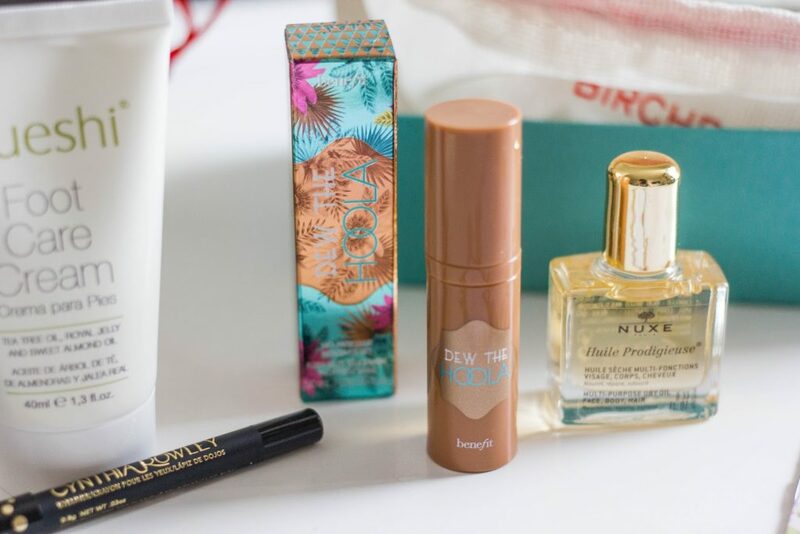 Benefit Dew The Hoola – 5ml sample size: Benefit’s bestselling bronzer in liquid form? Intriguing, right? This is something I was eyeballing anyway, but was reluctant to part with £22.50 for in case it turned out to be a bust, so this little sample is perfect. First impressions are it seems a little warm, but I’m excited to give it a go. Cynthia Rowley Beauty Eyeliner: Not a brand I’ve heard of before but I’m always keen to try new things. Kinda disappointed that this is black because I have a billion black eyeliners, but I guess we’re appealing to the masses here. It seems creamy and intensely pigmented, but the true test will be wear time! A nice mini size to have on hand for handbag touch ups or travel! Nuxe Huile Prodigieuse – 10ml sample size: I’ve had a few of these 10ml Nuxe Oil samples in beauty boxes previously, so I know I’ll enjoy using this. It’s a nice, lightweight oil that hydrates without making you feel greasy. A little goes a long way with this so 10ml is quite a generous size. Parlor By Jeff Chastain Detangling Leave-In Conditioner – 30ml sample size: I always hang on to hair product samples for when I’m travelling, so this will come in handy next week whilst I’m away. As a curly haired gal leave-in conditioner is a must, so I’ll see what this is like – although it’s highly unlikely I’d ever pay £17 for the full size! It’s supposed to contain sweet almond extract and B5 to keep things soft and sleek, & it’s got heat protection too, so I have high hopes! Kueshi Foot Care Cream – 40ml sample size: This is the kind of product I’d usually pass over uninterested, but my feet have been incredibly dry recently, so I’ll give this a go and see if it’s any good. It’s thinner than I expected, and scented with tea tree so it’s cooling on the feet – I imagine it would feel great on tired toes! Fingers crossed it’s hydrating too! 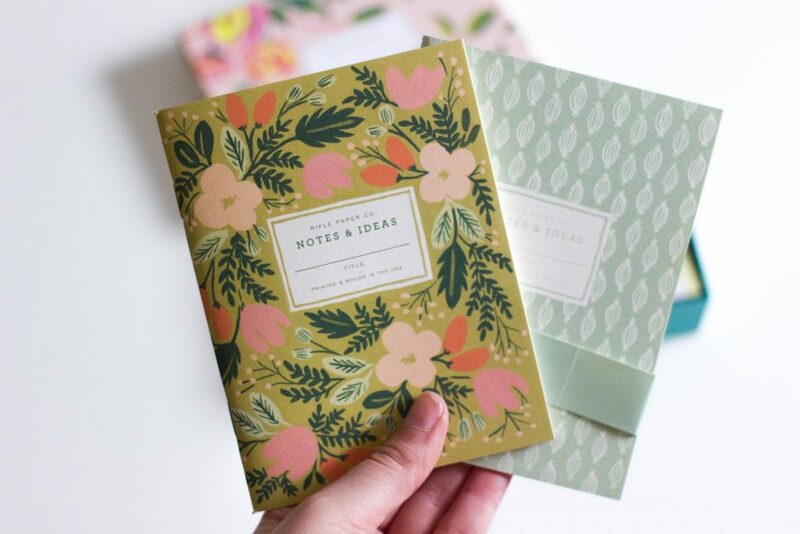 There was also an option to add two Rifle Paper Co notebooks to the box for an additional fee of £4 – who can say no to that? They’re the perfect size for on the go, I’m going to use one as a travel journal and one for on the go in my handbag! As always with RPC notebooks, they’re beautifully made with thick paper that makes my inner stationery geek grown with happiness. The verdict? I’m actually really pleased with this box, I think I’ll get use out of everything and damn, isn’t it pretty? !